Nordstom Cafe. Ok, but predictable. Joe – Great shopping, too bad we have to drive 2 hours to find a decent department store. Marie – Quit complaining. I drove, paid the tolls, and you found boots that you couldn’t find in Madison. I know this isn’t Barney’s but it is worth the trip. Joe – How about the lunch? We often stop at a Nordstom Cafe for lunch. They have them at most of the large stores and I, at least, have found them convenient and a nice place for a shopping break. The concept is part buffet and part traditional restaurant. For starters, you make your meal choices, pay, and then get escorted to a table where your server brings water, takes your beverage order, and delivers your meal. It seems to work. Marie – It works ok, but maybe we have been there one too many times. 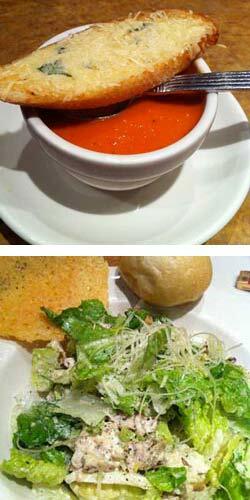 I ordered the Roma Tomato Basil Soup ($3.50 / cup) and the Grilled Chicken Caesar Salad ($9.25) to stay on the light side so I could keep up my shopping speed after lunch. The soup was as good as always, but that is the problem. I am starting to think that it is so consistent that it must come from a can. And come on! where are you going to get fresh ripe tomatoes in this country in November? The real issue was with my salad. To me, grilled chicken means warm chicken. It is November in Chicago, and I don’t need a refreshing cold salad with cold meat. I don’t know if cold chicken (and I mean ice cold) is the intent or if the kitchen screwed up. In any event, I would normally ask, but I was so disappointed that I only ate a few bites. Oh well, only eating half the soup and a few bites of salad left me lean, and open to eating again later. Joe – I fared better with my choice of the Soup Du Jour and the Lime & Cilantro Chicken Salad ($9.75). A nice selection of chopped greens with a few black beans, pumpkin seeds, roasted peppers, and corn that looked like it was just cut from the cob. It was nicely dressed in a zesty cilantro lime vinegarette and had just a little bit of heat from an unknown source. And, my chicken was warm. I give this salad high marks for flavor and because it met my expectations. Marie – Overall pretty low marks from me, not totally based on my choices for this lunch, but by the Nordstrom Cafe’s lack of imagination in their menu. It seems to be almost universal in mid-range restaurants these days to stay with essentially the same menu through all four seasons. Joe – I couldn’t agree more. In all fairness though, Nordstrom Cafe did have a Cranberry Turkey Sandwich on the menu. I guess that should satisfy those of us who desire seasonal choices. Even McDonalds makes extensive seasonal changes, but I guess they have to work harder for my dollar meal. I will return to Nordstom Cafe, but will lower my expectations based on your experience today. Marie – If you go to Nordstrom with me, you will be dining at their cafe alone. I will take my new shoes to another lunch location. We would love to hear your thoughts and feelings about this post. Just send us an email and we will review with the intent of publishing if we feel it is appropriate. We are not adverse to disagreement, and contrasting opinions will not disqualify your comments. We don’t publish links, shouting, vulgar language, or insults, but honor spirited discourse and honest opinions. This entry was posted in Food for THOUGHT on November 29, 2010 by AtlasSigns.